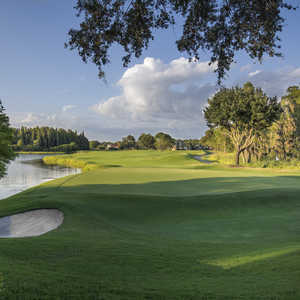 TAMPA, Fla. -- Most weekend and weekday hackers look to get away from the noise and the hustle and bustle of city life with a round of golf. The third hole at Northdale Golf & Tennis Club is a 199-yard par 3. That's tough to do at Northdale Golf & Tennis Club. Despite having some of the best-kept greens in the area, there's one problem that can ruin a pleasant afternoon of golf at Northdale. 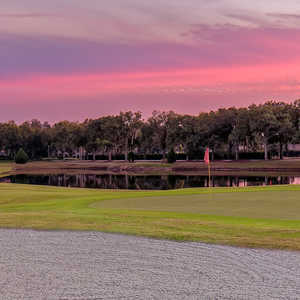 Located near the Tampa International Airport, planes fly directly over Northdale almost minutes apart, creating a noisy atmosphere and a longer round because golfers step away from their shots on a regular basis. Take away the airport, however, and Northdale is a pleasant golf experience, with tall cypress trees and well placed lakes creating challenging shots from tee to green. The 6,824-yard Ron Garl design is kept in excellent shape year-round and isn't cluttered with houses lining the fairways. "The course itself is challenging, but fair," said Joe Koly, the head professional at Northdale. "There are no hidden shots, but that doesn't mean it's easy. There are still trees and water, but you can see them up ahead and aren't in for any surprises." Unless a plane flies past while you are lining up a 4-foot bender. Northdale starts to show its teeth on No. 2, a 402-yard par 4 and the No. 1 handicap hole. It has a tight fairway and water down the left with a bunker siding a small green. Two of the next three holes are par 3s that require carries over water, but the course eases off a little coming down the stretch of the front nine. The second nine starts off with a short tee shot that requires a carry over a pond that covers the entire right side and front of the green. There's no more water until No. 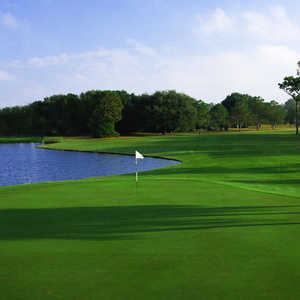 16, which requires a perfect tee shot with water down the right side and cypress trees lining the left side. Hit the fairway off the tee or forget about par. The closing hole is dry but has one of the tightest fairways on the course. It might not be the toughest golf course in Tampa Bay, but it's on the short list if you can ignore the planes. "I'd come back and play again," said Frank Laren of nearby Bradenton. "You forget the noise by around the fourth hole and it's a pleasant round. They have some of the best greens I've seen. I didn't get anything but perfect rolls all day." "I like the fact that there is limited sand here or I couldn't break 100 with these fairways," added playing partner Dan Shutzman. "This course has other ways to defend itself, but unless you get wet, there are hardly any unplayable lies." There is one other small problem beside the airport noise: no driving range. But, what the heck, hit a provisional off the first tee. The Tampa Bay area is teeming with driving ranges. If you can forget the noise and hit the local driving range before teeing it up, Northdale Golf & Tennis Club is a great golf experience and worth the inconvenience. The greens are in great condition, the fairways are tight enough to make for a challenging round, and it plays hard for the low handicaps and is tame for the higher hackers.